9th April 2011. In the morning safari some jeeps saw a pair of tigers walking form zone 1 of the Ranthambhore national park towards the Kalapani anicut in Zone 6. In the evening I booked a jeep for zone 6 and we found the mating tigers (T24 male and T39 female – both young adults) in a rocky plateau across the Kalapani anicut. The plateau had a short grass cover and some low trees. The sun was behind the tigers and the back light was very strong. Most of the time the tigers were in the shade and were no good for photography. 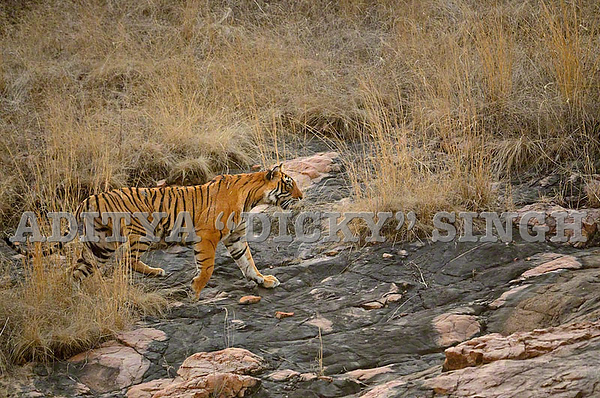 After about half an hour the tigress suddenly got up and started stalking towards the edge of the plateau. A mother bear with two small cubs riding on her back was walking towards the mating pair of tigers and the tigress had gone to confront them. By the time the bear realized that there were tigers close by, the tigress had got very close to them. That’s when the mother became aware of the tiger’s presence. The bear appeared to be in serious trouble and we expected the bear to bolt away but the bear had other plans. The bear cubs flattened themselves on the mother’s back while the mother charged at the approaching tigress. I don’t think that the tigress expected the bear to charge and tried to get out of what was by now a messy situation for both of them. 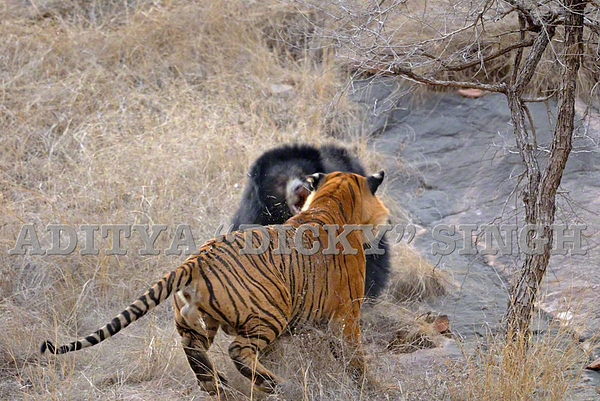 The bear blocked the tiger’s path and stood up on her hind legs to confront the tigress. 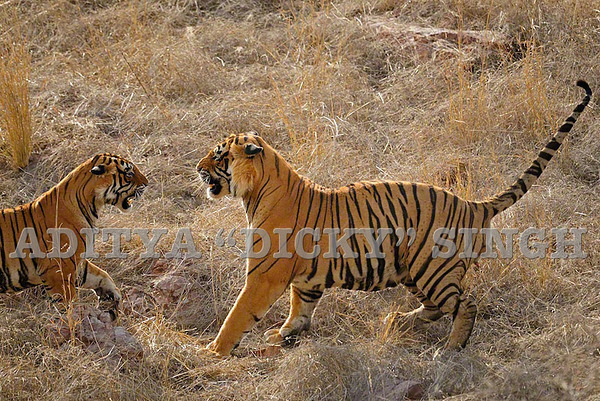 By this time the tigress desperately wanted to get out of the confrontation and kept backing off. T 39 in a young tigress who probably did not have the experience to take on a desperate mother. The bear started screaming loudly and got increasingly aggressive. Soon there was a loud slanging match between the two, which the bear won. The tigress beat a hasty retreat while the bear stood her ground. By this time the male tiger who was observing the drama from a little distance decided to get involved. T 24 is about 4 years old and had just come into dominance. We were worried for the bear. We had seriously underestimated the power of an angry mother. 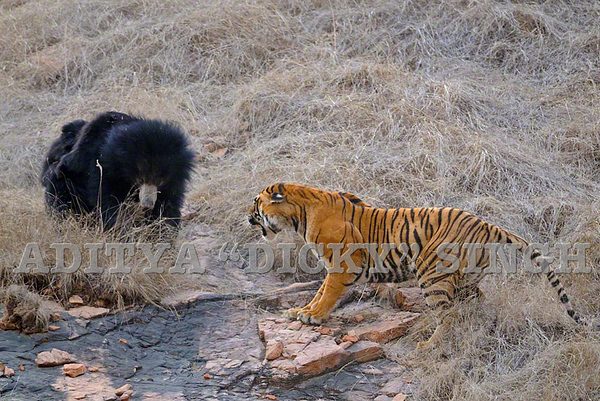 T 24, the young male star of southern Ranthambhore, could not even budge the bear. These two had another loud slanging match that went in the bear’s favour. T 24 soon realized the fury of an angry mother and started backing away from a now “one sided” fight and did not stop till he reached a safe distance. All this happened in exactly two minutes and 10 seconds. When the clock started it seemed that the mother bear had got herself into a very dangerous spot. In ten seconds she had taken control and two minutes later she had forced two tigers to back off. The victor walked off leaving behind two sheepish cats. one of the finest things i have seen n read for quite some time.. thanks for sharing! Very Very special sequence indeed, Aditya!! This must have been an absolutely mindblowing and epic two minutes of your life. I cannot imagine the thoughts and feelings that you were experiencing. How I wish that I had been there, especially if our Salim had been with us manning my camcorder. Apart from the once in a lifetime experience it would be worth a fortune to the BBC etc. 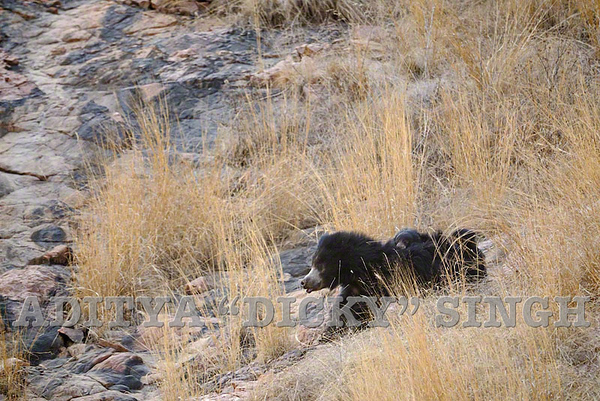 These photos, though, have to be one of the best sets of tiger/bear conflict imagery that exists. Moments like this could never be planned, there are pro’s out there that would give their right bollock to have taken these shots mate. Really pleased that it was you who got them though!!! Wow. amazing story and snaps… thanks for putting this together. 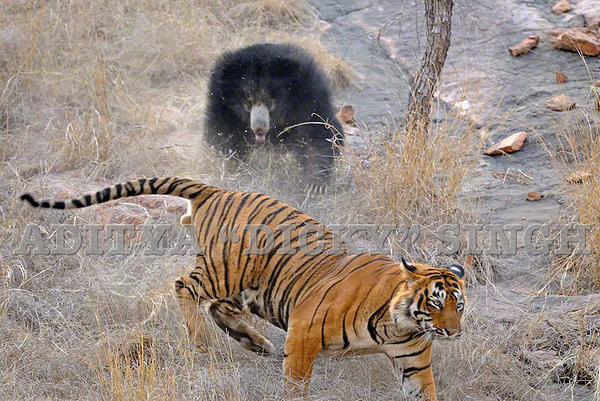 FANTASTIC story and pictures of drama in Ranthambhore and in ZONE 6!! Thank you for sharing with us! Do u use a tripod or s all handheld!!! Amazing incident and hats off to you Aditya for bringing it to the world in a most superb way. Simply awesome. nice picture and well written,we are proud of you. Awesome story… AMAZING amazing pics! Congratulations on one of the amazing sequence of photos… just mindblowing! are you thinking of doing a book Aditya? An absolute stunner!!! You witnessed something that one doesn’t get to see in a lifetime of chasing and tracking Tigers in the wild. This is an excellent sequence. Congratulations! Once in a lifetime capture. Congratulations bana. What a great story in pics. Absoulutely brilliant… Fantastic pictures and a great story… Thank you…. Awesome encounter. Almost re-lived it with your images and description. Incredible. Terrific sequence, wonderful story. 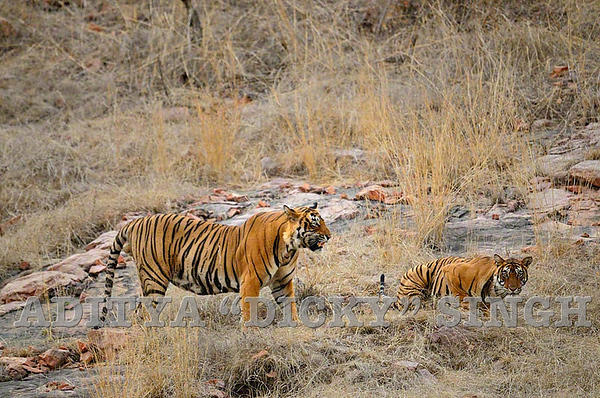 Those who want to see a different kind of tiger-bear encounter can find it on my site http://www.shekardattatri.com Cheers! Immortal wildlife moments …. will b cherishing & remembering them for years ahead…..
SAVE NATURE NATURE WILL SAVE U………. Heart-stopping pictures, Dicky! Thank you so much for sharing them! These are heart-stopping pictures, Dicky! What an invaluable record! Thank you for sharing this treasure! One of the best documentations of animal encounters I have seen. Feel as if I was there! You deserve a lifetime achievement award and your pic will surely adorn the cover page of National Geographic!! Congrats. 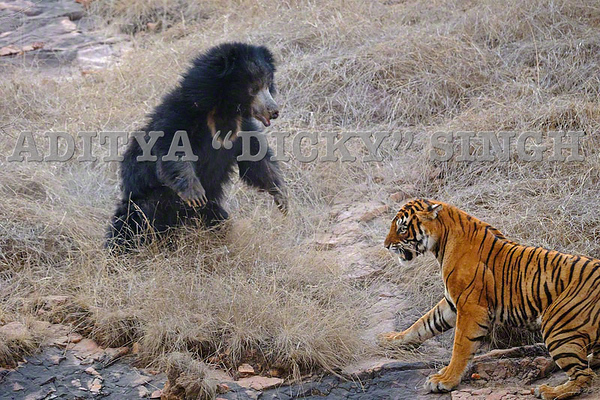 This 10 images tells compete story of that thrilling experice about Bear and tigers. You are extemely lucky to came across such rare jungle drama. Great sequence. Enjoyed. Please keep in touch. We shall soon meet. This must have been an absolutely mind blowing and epic two minutes of your life. Apart from the once in a lifetime experience it would be worth a fortune to the national geographic .discovrty etc. I do not know what to say . Should I praise the mother or the great photographer who provided us the scene. Thousand thanks and best wishes for a great job by Sh. Aditya. . Normally we get to see such things from National Geography, but this time we have our own footage from our Rajasthan. i am sure you would be feeling something in your stomuch while shooting. Great. Moments like this could never be planned, Amazing Shots its a rare sequence and u r lucky to be there at the right time with the right exposure and more active than the three of them hats of its a great feast for our eyes and great job An absolute stunner!!! You witnessed something that one doesn’t get to see in a lifetime of chasing and tracking Tigers in the wild. This is an excellent sequence. Congratulations!Amazing Shots & Clarity. i Hats off to u!! Beautiful narration….class shots taken in those 2 min 10 sec…. Moments like this could never be planned,Amazing Shots & Clarity.Amazing Shots its a rare sequence and u r lucky to be there at the right time with the right exposure and more active than the three of them hats of its a great feast for our eyes and great job and thanks for sharing. An absolute stunner!!! You witnessed something that one doesn’t get to see in a lifetime of chasing and tracking Tigers in the wild. This is an excellent sequence. Congratulations! my most sincere best wishes to your lense and camera and you tooooooooo…………. Thank you so much for not only sharing the pics, but also recounting the story. This is an awesome piece of work. I love zone 6. I think it is one the prettiest parts of the park. and I find the whole sequence amazing but at the same time,I wonder, where are you hiding the real gems ?!? 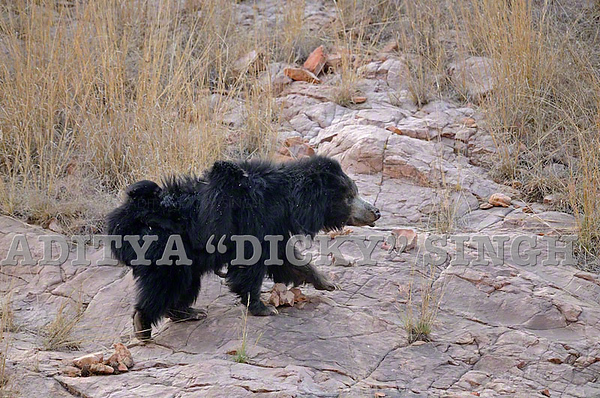 very nice pics, a tiger wont fight unless it has no other go, it can’t risk injuries, as indian sloth bear’s have 5” claws!! amazing aditya wonderful snaps and what a sight it must have been for the few minutes in front of the action unfolding in front of you. Congratulations Dicky! Absolutely “Brilliant Captures” of what truly was a rare wildlife moment. Thanks for sharing the same with us! Any video footage of the same? Superb moments beautifully captured. Surpass everything I have witnessed in wild. Awesome story …. phantastic pictures. Thank you for sharing Aditya. Dear Adityasing, these all are very very nice photos captures by you, congratulation…..
Action delivered live to our desktops. Most wonderful narration of account of wildlife experience..even i felt i am watching it unfolding…Thanks a million for sharing it with us..cheers!!! hey this one of the best examples of mothers instinct to protect her young ones!!!!!!!!! !very lucky to witness this n thankz for sharing this rare sequence of wildlife with all..
keep on sharing sir ji!!! Fantastic photos and thanks for sharing. Wish you many more rare opportunities in the future. Fantastic story! Loved the series. what an observation!! You again were at the right place at the right time! Phantastic documentation and pics showing the wonders of Ranthambhore. Thanks for posting and sharing that 2 minutes. What a moment…and amazing capture !!! It’s a GREAT LEARNING FOR ME even after roaming in the Indian Jungles since early seventies.Till date I was of the view that a Himalayan Black Bear or a large Tusker could garner enough courage to challenge a Tiger Couple. 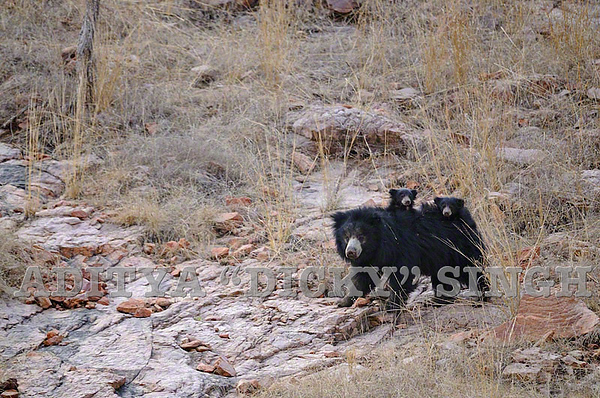 A MOTHER SLOTH BEAR with two cubs to defend will show such daring agression was beyond my imagination. This is mind blowing stuff. I jumped in my chair couple of times just seeing your images. What a sight it must have been to watch and photograph. Thanks a ton for sharing the story and the images. Fabulous clicks. Beautifully gathered and narrated. I was in Ran-stam-bhor last montth – April 2,3,4,took 2 morning and 1 evening safari on routes 4 & 5.The last morning safari that we had was when we caught a glipmse of the big cat on Route 4. We also sighted a leopard in the Kachida valley, on the periphery of the park among its other occupants. This was my first visit to this dry deciduous forest and I swear I am in love with its tigers,its wildlife and the magnificient fort that stands inside the reserve. Will be there again soon. Until then its your blogs all the way to keep us updated :)..Cheers!!! Excellent blog. I have been reading your write ups and it is sheer joy to see a person so passionate about wild life especially Tigers. It is indeed a blessing to be part of this world, few have this opportunity. Will be reading more. I hope people don’t just read and forget about these majestic animals but do their bit to save them from extinction. Best to you. Keep sharing. Do visit my blog too. amazing shots and amazing story. i am also regular at national parks esp at ranthambore. quality of snaps really great or i can say its an extraordinary stuff. i was in the same park from 18 to 23 of june, 2011 and had total 9 safaries, we found same tigress T-39 twice. i must say she is really beautiful trigress. anyway thanks a lot for sharing with us such a great shots and story. this was awesome. and you narrated it so well with pics- could close my eyes n imagine it. u should be so proud to witness something that wildlife photographers cannot in their entire life. and thanks for sharing. my kids loved the whole thing-the babies n their mom was not hurt was the best part for them. n i guess for all of us. a fight without any bloodshed.congratulations for photographing that. I saw some of these wonderful action photographs on INW site earlier and they are still viid in my mind. Fabulous! Hope to see you on your own turf one day. Cheers and keep it rolling! Wow … Terrific! What an awesome experience – for the bear cubs, the young tigers and of course, you! Lovely images and just look at the way luck favours you! Brilliant. Brilliant. Brilliant. But I would say there is no luck involved – just experience, skill and planning (which people sometimes mistake for luck). superb……clicks wanna be a part of your team some day….